I started ghost writing romance because it was under the table. I make good money, people are reading my work, and best of all, no one has to know where I am. These days, paranormal romance seems to be the big thing with humans. Specifically, Vampire Boyfriends. I don’t mind werewolves, aliens, or even dragon shifters. They’re all harmless enough. But I refuse to write about Vampire Boyfriends. When you live in the shadows, some things just hit too close to the truth. Anton Chekhov had a theory about guns in stories — if a gun is placed into a narrative, then it will go off, sooner or later. Like Chekhov’s Gun, the Vampire Boyfriend has a timer, as well — once he’s in your life, it’s only a matter of time before the trigger is pulled and he loses control. He’s hardwired to desire you. Your blood sings to him, and he’d like you to believe that it is only he, and he alone, who desires you to the exclusion of all else. But what calls to him is his hunger. Do not be fooled. The way to the Vampire Boyfriend’s little dead heart is his stomach. 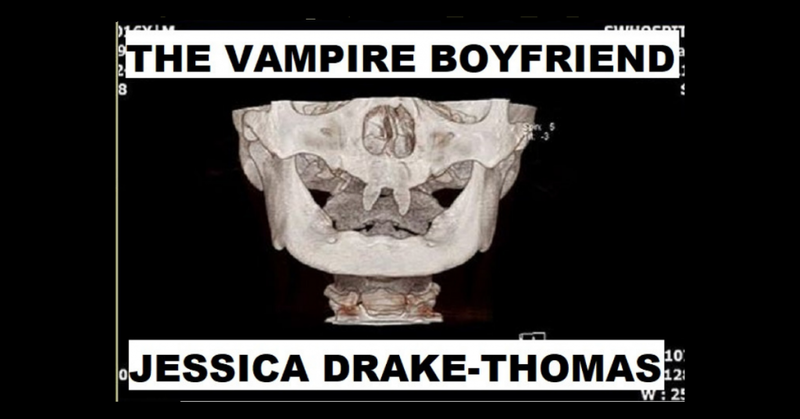 The Vampire Boyfriend is the ultimate apex predator. His physical beauty is staggering — he reminds you of all of the greatest sculptures — every feature has been polished to perfection by immortality. He has it all — the face of an angel, the mane of a wild stallion, the six pack of the Gods, the bone structure of Khal Drogo. You can barely contain your desire for him, and it sparkles through your eyes, seeps out of your pores. It’s like perfume to him— almost primed to perfection. He’s studied all of the great romances. He was alive to see them for himself — Antony and Cleopatra, Tristan and Iseult, Henry VIII and Anne Boleyn. He is able to mimic the correct movements and brings out all of the trappings of the perfect romance—perfectly aged wines he bottled himself, bouquets of roses like blood splatter, his hand placed just so on your lower back. He makes you wait just long enough to move on to the next step, until your need for him is so great, it’s consuming you like wild fire. He’s had centuries to practice, and his timing is on point. He wants you to be intoxicated, so you miss the red flags. He wants to own you, to possess you, wholly. You are the queen of his heart, and he will tell you: you are his. The Vampire Boyfriend, despite living in a world that contains feminism and women’s rights, has still retained his antiquated notion that the object of his affections requires around the clock protection. He will call it “old-fashioned.” He will call it “chivalry.” You will not have to lift a finger, pay for a thing, or worry about other males ogling you. He moves faster than physics can explain, he has more money than a dragon, and he can easily hold all weaker males in check. Despite your claims that you are a modern woman and wish to be treated as such, he will gnash his fangs and turn a deaf ear in your direction. He’s stuck in the Dark Ages, when women were thought of as property. When women existed only to please men. When women were too delicate to stand alone. Let’s call it what it is: defending his food source. He’s trying to put you in a box. Literally. You’ll stay, despite your misgivings. Despite the little slips, here and there. You will always stay, because you believe in the façade that he has created. After all, he looks so human. And he cares for you, as if you are a garden. Heed this—Dead things cannot nurture. They can only support growth through rot. The Vampire Boyfriend is incapable of decomposition. He is like a stone. He’s just so good at playing the loving partner. You’ll stay, of course. You’ll stay despite the fact that time, for you, is running out. You’ll fight, naturally, because you’ll feel strangled by his over-attention. He’ll say that he’s trying to protect you. That he’s afraid of losing you. That the world is a dangerous place for humans. Chances are, he’ll be proven right because if one Vampire Boyfriend exists, then there are others who think and act just like him. Chances are, another Vampire Boyfriend will smell the combination of your blood mixed with desire, and come hunting. Or, perhaps, he has a long-standing grudge with your Vampire Boyfriend, as they do. Chances are, he’ll attack you, leaving your current Vampire Boyfriend the opportunity to become your hero. You will become comforted by his attentions whilst you are healing after the attack from the rival vampire. Your Vampire Boyfriend will care for you in every way. He’ll blind you to his faults with his displays of goodness, snuggle you with his ice-cold arms. Stroke your hair with long-nailed fingers. He’ll make you forget everything — like his recent tantrum, your fight last week, that guy from the bar who he murdered for looking at you. He’ll whisper sweet things into your ear, nuzzle his ice-chunk nose over your carotid artery. He’s not really thinking about you, but the delicious river, oozing beneath your skin. How the scent of your blood seeps through the bandages. Now that he’s fought another vampire, he’s starving. Everything he says and does will lull you into a stupor, so that you will not fight back. He will make you forget everything, who you are, who you were, and the gaping wound of his tooth-filled mouth as he finally loses control. There is a door that I could open, in order to tie this up with a neat bow. But I won’t, because he might be lurking on the other side, waiting to be invited back in. I have run too far for him to find me now. The scars where his teeth tore open my throat have not been smoothed away by time or immortality. But know this: a story about a man who wants to possess you isn’t a romantic story. It’s a story about a beautiful, cold monster and lengths he will go to satisfy his hunger.